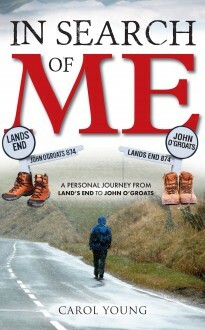 In 2004 Carol Young set herself a challenge – walking in stages from Land’s End to John O’Groats, on her own. For someone who had only once travelled away from home alone, it was quite a challenge, particularly as it meant leaving her husband and children for weeks at a time. The journey tested Carol’s physical and mental strength, determination and her integrity, to say nothing of her understanding of maps, walking gear and survival skills. The experience proved rewarding and life changing. In over 1200 miles of plodding the lanes and tracks of the UK she met many fascinating people, whose kindness and generosity helped to make the task enjoyable. There were glimpses of rare wildlife, breath-taking scenery and several ordeals at the hands of wind, weather and water. In Search of Me is Carol’s heart-warming story, illustrated by many evocative photographs of her experience.